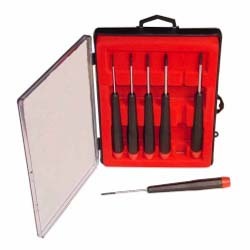 Consists of 6 ergonomically shaped, lightweight screwdrivers. Shafts are molybdenum steel, hardened and chrome-plated for strength. Precision-ground tips allow sure fit and control. Contoured, non-roll, swivel handles fit comfortably in the hand, and allow fingertip rotation. Includes 4 slotted head sizes (1.5, 2, 2.5, 3mm) and 2 phillips sizes (#00, #0). Hard plastic storage case.